With Jeffrey Loria getting ready to sell the Miami Marlins, the list of names involved in the bidding grows more unbelievable. Legendary Chicago Bulls guard Michael Jordan and “singer/songwriter” Pitbull are the latest two celebrities enter the struggle. The Marlins bidding war was confusing already, and the inclusion of Jordan and Pitbull is making it even harder. The two have not joined forces to build a last-minute fourth contender. Instead, they’ve given their names, and some of their cash, to help the other groups involved. Jordan is one of many investors to join a group led by Derek Jeter. Jeter is the favorite for the franchise, and has sworn the highest offer, but needs time to secure funds. Jordan is set to help there, although reports by the New York Post say it would not be a high amount. Pitbull is joining a rival group led by Tagg Romney, son of former presidential candidate Mitt Romney. Hall-of-Fame Atlanta Braves pitcher Tom Glavine also forms part of that group, which now also includes former Florida Governor Jeb Bush. Bush was initially partners with Jeter, but a power struggle between them made Bush leave. In a move, straight out of from a wrestling playbook, Bush joined forces with Jeter’s biggest rival a few weeks later. A third group still involved in the bidding, led by Miami businessman Jorge Mas. His team may not brag about star power, but he’s equally candidate to be the next owner. The last couple of days has seen emerge conflicting reports over which group will win the team. The New York Post trusts Jeter’s group is closing in on the Marlins. Forbes says the team will be owned by Mas unless something crazy happened. Something as Jordan and Pitbull entering to the stage. 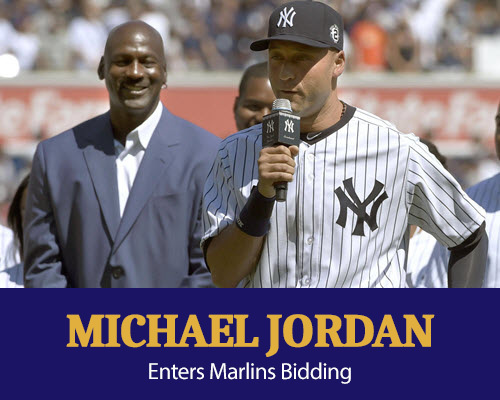 In brief, Michael Jordan and Derek Jeter have teamed up to take down Tagg Romney, Tom Glavine, Jeb Bush and Pitbull in order to buy the Marlins. While those two groups confront each other, Jorge Mas may jump in and take the team for himself. The future of the team, by now, seems to be totally uncertain.